Known changes of CO2 concentration with temperature are too small by a factor of 10, hence not ocean outgassing. Annual emissions of CO2 by human use of fossil fuels rose from 3 million tonnes of Carbon (11 million tonnes of CO2) in 1751 to 54 million tonnes of Carbon (198 million tonnes of CO2) in 1850. After that fossil fuel use rose sharply so that by 2008, annual emissions (including from cement manufacture) had risen to 8749 million tonnes of Carbon (32 billion tonnes of CO2). The rise in the atmospheric concentration of CO2 also began around 1750 and has followed the emissions up. This extraordinary coincidence strongly suggests that anthropogenic emissions are the cause of the rise in CO2 concentration. 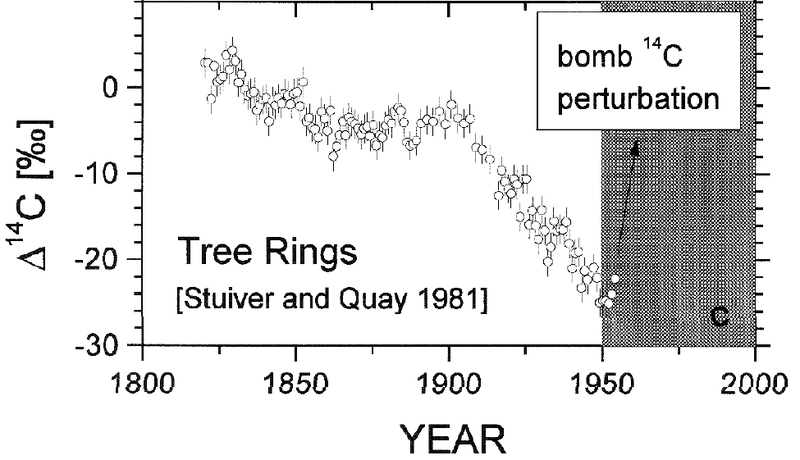 The increase in CO2 concentration over the long term (1850-2005) almost exactly correlates (corr. : 0.997; R^2: 0.993) with cumulative anthropogenic emissions from all sources including Land Use Change (LUC). The close correlation has continued in recent times, with a correlation of 0.9995 when compared to the Mauna Loa record (r^2: 0.999). So exact a correlation would be extraordinary if anthropogenic emissions were not the cause of the increase in CO2 concentration. 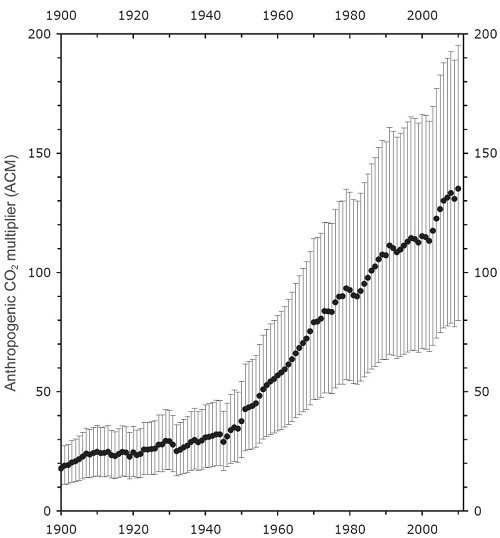 Over the course of the twentieth century, the increase in CO2 in the atmosphere measured in tonnes has been less than anthropogenic emissions in every year, and has averaged only 44% of anthropogenic emissions over the period from 1850-2005. Indeed, growth in atmospheric emissions probably has not exceeded anthropogenic emissions since the early 1880s, approximately the time anthropogenic emissions reached the equivalent of 0.45 ppmv of atmospheric concentration. 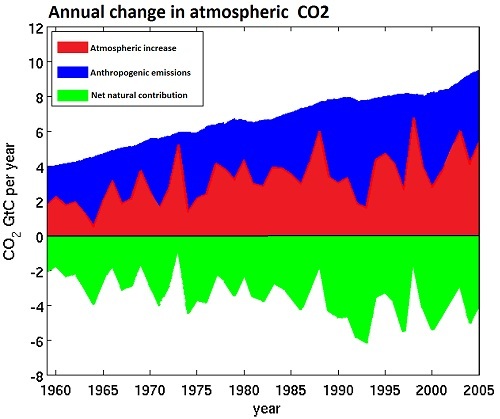 It is interesting to note that the airbourne fraction, ie, the atmospheric increase divided by total emissions, has increased slightly in recent times. This means that natural carbon reservoirs have acted as a net sink over the course of the 20th century, and strongly indicates that the source of the increase in CO2 concentration is anthropogenic. Carbon 14 is formed in the atmosphere by collisions between cosmic rays and Nitrogen. It has a very short half life (5,730 years), but atmospheric C14 is continuously replenished, maintaining a near constant concentration. Buried C14 is not replenished, however. As a result, whether from volcanoes or fossil fuels, CO2 from long-buried sources has effectively no C14. The addition of large quantities of CO2 from a long-buried source to the atmosphere will result in a significant decline in C14 concentration in the atmosphere, which is what we see. More recent, high precision measurements show the decline in C14 continued after the end of atmospheric nuclear testing.This is strong evidence that the source of the increased concentration of CO2 is fossil carbon, either from volcanoes or from fossil fuels. Carbon has two stable varieties (isotopes), C12 an C13. Because C13 has an extra neutron, it is heavier. In photosynthesis, most plants find it easier to take up the lighter C12, and do so at a higher rate than they take up C13, with the result that carbon compounds formed from the products of photosynthesis, including plants, animals and fossil fuels have a lower C13 to C12 ratio than does the atmosphere. Introducing a large quantity of CO2 derived from photosynthesis would cause the C13/C12 ratio to decline. In contrast, CO2 introduced from volcanoes or from outgassing from the ocean would not significantly affect the C13/C12 ratio. In fact the global C13/C12 ratio has declined, which is very strong evidence the source of the CO2 increase has was C12 enriched, ie, derived from photosynthesis. Therefore it is very strong evidence that it comes from the biosphere or fossil fuels, rather than from volcanoes or oceanic outgassing. The observed decline in O2 is straightforward. 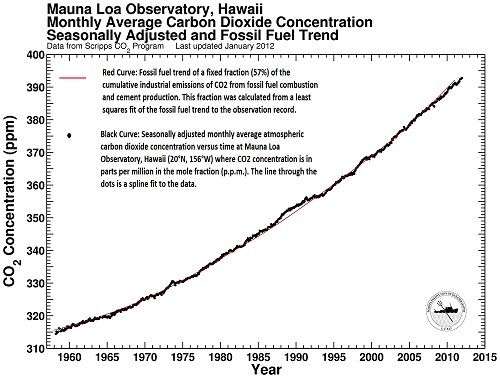 The diagonal arrow from the start point marked "fossil fuel burning" represents the expected change in CO2 and O2 concentrations from known fossil fuel consumption. The arrow marked "ocean uptake" represents the uptake of CO2 by the ocean, which does not affect the O2 level. The arrow marked "land uptake" is the uptake of CO2 and release of O2 by photosynthesis, which also decreases the CO2 concentration and increases the O2 concentration. Finally, the small arrow marked "outgassing" represents outgassing of O2 from the ocean, which does not affect CO2 concentration. That outgassing is partly the result of a warming ocean, and partly a result of the very slight decrease in the partial pressure of oxygen in the atmosphere. These factors are reasonably, but not exactly known. It is important to note that because the fall in O2 concentration is significantly less than that predicted from known combustion of fossil fuels, the uptake of CO2 by photosynthesis must exceed the combustion or decay of modern organic material from either anthropogenic (Land Use Changes) or natural sources. 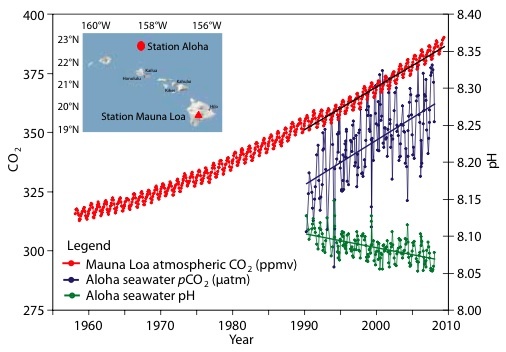 Simultaneously with the rise in the concentration of CO2 in the atmosphere, the concentration of CO2 (and its equilibrium products) in the ocean has been increasing. The rise in CO2 in the ocean is referred to as an increase in the "partial pressure" of CO2, and results in a simultaneous decline in the partial pressure of Hydrogen (pH), ie, an increase in the ocean's acidity. If the amount of CO2 in the ocean was falling, the partial pressure of CO2 would be falling, and the pH rising. This is very strong evidence that oceanic outgassing is not the cause of the rise in atmospheric CO2. Scientists have used a variety of methods to determine the CO2 emissions from volcanoes. A common method is to use a tracer gas, ie, a gas emitted from volcanoes but which does not stay in the atmosphere for long. Determining the emissions rates of the tracer gas from volcanoes, together with the concentration of those gases in the atmosphere allows the overall level of volcanic activity to be measured. Once that is measured, measurements determining average rates of CO2 emissions for a given amount of activity can be used to determine the global CO2 emissions from volcanoes. Other techniques are used to measure CO2 emissions from volcanoes, mid-ocean ridges and subduction zones under the sea. The emissions, from all volcanoes, both on land and under sea, are about one hundredth of anthropogenic emissions. While there may be some error in the estimates, it is unlikely that the error would be large enough for volcanoes to be emitting a sizable fraction of anthropogenic emissions. That strongly suggests volcanic emissions are not the source of the increased CO2 concentration. Anthropogenic Emissions from Land Use change and deforestation represent 10% of all human emissions (0.9 PgC of 10 PgC). Over the last century, human-caused deforestation and other land use changes have been by far the largest cause of change in land cover, and hence natural changes cannot be significantly larger than that. (Source) Indeed, as discussed regarding the declining oxygen concentration, that decline together with the land uptake shows that the biosphere is a net sink for CO2. During past "ice ages" (glacials) CO2 concentrations have correlated with temperature, with approximately a 22 ppmv increase in CO2 for every 1 degree increase in temperature. 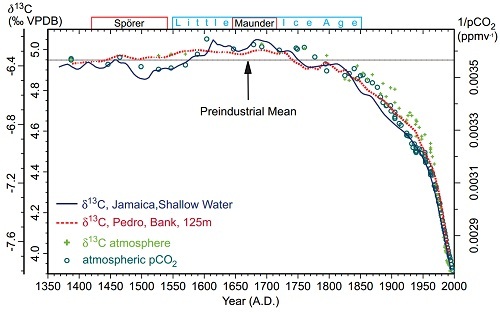 In more recent historical times, there was an increase in CO2 concentration during the Medieval Warm Period (MWP) relative to the Little Ice Age (LIA) of about 10 ppmv for approximately a 1 degree C change in temperature. Given that global temperatures have increased by 0.7 C since 1850, we would expect an increase in CO2 concentration of between 7 and 15 ppmv based on historical precedents. That CO2 concentrations have increased by approximately 110 ppmv over that period is very strong evidence that the source of the increase was not outgassing from the ocean. As a child I enjoyed playing Cluedo (Clue in the US market). I soon learned you discovered more from the questions people did not respond to than from those that they did, and developed a matrix from which to plot responses and non-responses. Filling in the matrix soon honed in on the correct answer, who killed whom, with what and where. Science is sometimes like that. The lines of evidence are the questions we put, and if we plot out our matrix, it quickly becomes clear that it is the humans who have caused the rise in CO2 levels, by burning fossil fuels in the twentieth century. Every other hypothesis makes a host of predictions that do not pass the test of the evidence. Correction: The figures in section (2) have been corrected as of 12:45 PM, 29/07/2012. The nature and reason for the correction explained in my comment of 12:40 PM of that date. The figure for the airborne fraction in section 3 was corrected at 8:54 AM, 18 th Feb, 2013.
well done! It's things like this that sealed the case for AGW in my mind - you've presented 10 solid lines of evidence linking fossil fuel emissions to rising atmospheric CO2. One might imagine that a handful of those evidences are critically flawed, but that still leaves multiple independent justifications intact. To doubt the conclusion, you'd have to explain, not just why ALL the pieces of evidence are flawed, but how the flaws coincidentally line up in favor of the same conclusion. This would take considerably more work than the average fake skeptic is willing to invest. And when you move beyond "Emissions => CO2 Rise" to other core tenants of AGW, you see similar lists of solid, independent evidences (NOAA's graphics on signs of a warming world and human fingerprints on warming come to mind). I really don't see how someone can look at this and not, at least provisionally, accept the obvious conclusions. This is a question I run into surprisingly often. Thanks for putting the answers all in one place. For me, it's the mass balance argument that seals it. There is physically no way that the rise isn't being caused by humans. Anyone who sees the mass balance emasurements and then accepts claims that it's a natural rise really needs their skepticism checking. 1) maths is wrong and bigger numbers are actually smaller than smaller numbers or 2) chemistry is wrong and molecules of carbon dioxide magically disappear in the atmosphere. That's the sort of hypothesis that's needed for a natural rise in CO2 to be logically consistent. The fact that so many 'skeptics' argue it's natural is absolutely incredible to me! Well, I'm pretty much of the same opinion, since I know no one who has extracted the steel and chrome and oil needed to plastics from the ground, and who has built, f.e. a car from these, literally from scratch. Some people might argue learning is natural for humans, and that the products made with the skills acquired from learning are thus also natural, but I'm more old fashioned with my definitions and append these things to culture, since the support structure to build something from scratch (i.e. from the elements that have not been modified by other humans), is likely to involve some sort of culture. To take an example, f.e. I couldn't build even a wooden bow naturally, for I do not have the skills to weave a strong string from the wool that I could get from lambs by some stone tools I can make (I've not done any refining of metals though I know the principle (that I couldn't have found out by myself (the lake/swamp ore process)). Moderators please delete this if this is too out of line and OT. O2 & CO2 are matched molecule for molecule, so deltas in O2 & CO2 should be the same. Am I missing something here? Other hydrocarbons are very similar. Estimates of total O2 consumption depend on estimates of total fuel use divided among the three main form of fuels - coal, oil, and methane. Super post Tom, this is the definitive SkS article on this issue! Tom, you nailed it -- in content, style, and method. Agree with Dikran Marsupial "definitive" describes your piece perfectly. I'd like to see a follow-up definitive posting using the same methodology to nail down atmospheric CO2 as the cause of current warming. It would be clearer for me and would also indicate the difference between CO2 emmissions from burning pure coal vs. carobhydrates. Regardeless my comment herein, I join my predecessors in praising the value of this article: this is the best summary of arguments why humans are controling CO2. The AGW linking piece (CO2 rise=>warming) was best explained by Richard Alley in AGU 2009. You commented briefly about this weeks ago, and I'm glad you put all the effort and work to release this post with more depth. I'll definetely save it as a reference. Really great to see a short succinct summary with the points expanded on. This is great fodder to fight away the armies of the night. As i understand the Oxygen Depletion is attributed to greenhouses gases like Methane breaking down in the upper atmosphere and this reaction consumes O2 molecules. Moderator Response: [DB] As an FYI: promoting awareness of research tangential to the OP is acceptable; promoting your blog is not. Self-promotional link snipped. Do you have a citation for your Oxygen Depletion understanding... one complete with actual numbers? Nothing is ever "just this one cause," and the conversion of CH4 + O2 to CO2 and H2O is an ongoing natural process that gets H2O into the upper atmosphere. The question becomes one of simple math... how much O2 does the increase in the amount of CH4 (presumably from anthropogenic sources) consume, and how does this compare with the total oxygen depletion. Without those numbers, and a citation, your statement is pure speculation. But I strongly doubt that the numbers balance, or that fossil fuel combustion fails to dwarf the upper atmosphere methane contribution. Observations of ozone show a thinning of the Earth's protective stratospheric ozone layer by about 3 to 8% overall since the 1970s. In the upper stratosphere, ozone depletion has been from 15 to 20%. Again, the model is better able to reproduce these values when increased water vapor is included. This is especially true in the upper stratosphere, where ozone is most sensitive to water. The model indicates that increased water vapor accounts for about 40% of the ozone loss in the upper stratosphere, and about 20% of the overall loss to date. And the reaction Shindell mentions, includes Oxygen. Why did you change topics to ozone? We were discussing O2 depletion in the entire atmosphere, and I presume (because we are on the topic of this post) as an indicator of an anthropogenic cause of CO2 increase. Any casual reader of your comment is going to interpret it in that fashion, and your comment suggests oxygen depletion is not an indicator of an anthropogenic source of CO2 increase. As such, you need to support the claim. Your shift to ozone depletion has no bearing whatsoever on the matter, and dodges the point. Your explanation of the chemistry is similarly irrelevant. I well understand the reaction, and anyone who doesn't can google it quickly enough. But you still haven't provided the necessary foundation for your argument, which is observational and computational evidence not merely that the reaction occurs (as it does naturally and continuously), but also that the mass balance involved, as compared to fossil fuel combustion, is high enough to diminish the argument in the original post. You've failed to do so. I'll give you a second chance, or dismiss your statement as unsubstantiated noise. Sphaerica: "Why did you change topics to ozone?" Because the process of ozone depletion causes oxygen depletion. This statement is incorrect. Ozone depletion produces oxygen, as the wikipedia articles referenced describe. Chris@...multiples: It *generally* does not look very good, to contantly cite Wikipedia as a *primary* source of data. Nothing wrong with using it here and there but in addition to your dodging Sphaerica's direct questions, I would think you'd use more academic sources to back up what you posit. Phil "methane water vapor oxygen depletion atmosphere"
Moderator Response: TC: Link made live. You also need to read section 4.2.3 of the document you linked to. "In this case, the reactive hydrogen exists in the form of two liberated OH (hydroxyl radical) molecules which become the catalyst in a pair of reactions with odd oxygen (OX) that result in a net loss of OX, by which we mean a net loss of both ozone molecules and free oxygen atoms." Is there anything we've forgotten? Perhaps O2, commonly referred to as "oxygen"? Does the statement "O3 + O ==> 2O2" show up somewhere? "4.2.3 HOX catalytic cycles -- The importance of these two species, methane and water vapor, in ozone chemistry is that they transport and release hydrogen into the stratosphere. The activated hydrogen that is released can then participate in the destruction of odd oxygen, i.e., ozone, through a variety of catalytic cycles. These reactive hydrogen (HOX) cycles are summarized by Figure 5.15. On the figure, we see this represented by the line with the superimposed blue (O, O3) box. The O2 (molecular oxygen) product is not represented, because it is not a hydrogen species. All of the reactions which lead to ozone creation are colored in blue, while ozone photolysis is colored in magenta. Each water vapor molecule can be transformed into two molecules of HOX (reactive hydrogen) through reaction with O atoms via a reaction of water vapor with the singlet D oxygen atom. Recall that HOX = OH + HO2. In this case, the reactive hydrogen exists in the form of two liberated OH (hydroxyl radical) molecules which become the catalyst in a pair of reactions with odd oxygen (OX) that result in a net loss of OX, by which we mean a net loss of both ozone molecules and free oxygen atoms. (See Figure 5.15a) Notice that the NET effect of the reactions is simply a conversion of two odd oxygen molecules into two molecules of O2. The sum of reactive hydrogen, OH + HO2, is conserved by this cycle." So, in context it is clear that the net reaction to which your refer is the loss of O3 and O and the creation of O2, hardly an explanation for the depletion of O2 from the atmosphere. That section, however, does not refer to section 4.2.2 from which you draw the methane related reactions, so I am unsure why you refer to it, or why Phil drew attention to it. Chris Machens @13 raises an interesting question. Unfortunately he then diverts into a side issue with a discussion of Ozone, which is essentially irrelevant. All we need to recognize is that methane released to the atmosphere will eventually break down to a CO2 molecule and two H2O molecules, consuming two O2 molecules in the process. As CO2 and H2O are the most chemically stable products of the various reaction pathways between CH4 and O2, we can ignore the details. The question then arises, how significant is the release of methane to the depletion in atmospheric O2? Total methane emissions have raised the methane concentration in the atmosphere by approximately 250 parts per billion since 1978. Given that the atmosphere contains approx 1.8 * 10^20 moles, and the molar mass of methane is 16 grams per mole, that represents emissions of 720 million tonnes of methane. Over approximately the same period, humans have used for energy, or flared over 350,000 million tonnes of methane. Thus emissions of methane represent just 0.2% of human consumption of methane. The figures used are conservative, and do not include the fact that much of the methane emission comes from fugutive emissions (gas leaks) from human energy use which are incorporated in the total human consumption. So, while Chris has identified a genuine additional source of O2 depletion, it is too small relative to human use of gas for energy to be noticeable within error; let alone compared to the total use of fossil fuels, of which gas is a very minor component. Thanks for your input everybody. "Uncontrolled build-up of methane in Earth's atmosphere is naturally checked—although human influence can upset this natural regulation—by methane's reaction with hydroxyl radicals formed from singlet oxygen atoms and with water vapor." With ozone depletion causes oxygen depletion is the result from the methane -> water vapor - reaction, and then the water vapor in the cold stratosphere destroys ozone. So maybe the ozone destruction doesn't destroy oxygen but it happens before that. "crop alone is responsible for approximately 50-100 million metric tons of methane emission each year"
So i think the emission of methane are higher than 0.2%. However i do not meant to say this is the only source, just another - and possibly above 0.2%. Chris Machen @27, Wikipedia lists total methane emissions of 600 teragrams per annum, or 600 million tonnes of methane per annum; and 20 terragrams (million tonnes) increment after sinks are taken into account. Compared to the 2008 fossil fuel plus cement emissions of That is less than the 720 million tonnes 8750 million tonnes, that still only represents 7% for total emissions, or 0.2% for net emissions. Of those emissions, those from wetlands (225 Tg/a), termites (20 Tg/a), ruminants (115 Tg/a), waste treatment (25 Tg/a) and biomass burning (40 Tg/a) are all generated from carbon originally removed from the atmosphere by photosynthesis in recent times. As such, the full cycle involves no net change in O2 levels. A further 110 Tg/a comes from fugitive emissions from the fossil fuel industry, and hence are already accounted for as part of total human emissions from fossil fuels. That leaves just 65 of 600 Tg/a that can make an additional contribution to the reduction of O2 levels in the atmosphere. That represents an additional 0.74% O2 reduction from methane emissions. Thus calculated, I can concede the amount is greater than 0.2% - but I certainly cannot see how it could be considered significant. I should note, however, that only clathrates represent emissions of methane which do not derive their carbon from either recent photosynthesis (hence having no net effect) or from fossil fuels (hence already accounted for). Clathrates represent 0.11% of the effect of fossil fuels based on the wikipedia figures. "It is important to note that because the fall in O2 concentration is significantly less than that predicted from known combustion of fossil fuels, the uptake of CO2 by photosynthesis must exceed the combustion or decay of modern organic material from either anthropogenic (Land Use Changes) or natural sources."